It’s logical to think that any kind of museum will be going to hold on to all of its exhibits ad infinitum, but that’s not always strictly true. Sometimes it’s due to financial reasons, occasionally it’s thanks to local politics, but the most common reason – and the situation that we see here – is due to a relocation to a smaller venue. The collection in question is the MC Collection, in Stockholm, Sweden, and the curator and owner, Christer R Christensson, is editing the impressive stable of bikes that he owns at the moment down to 120 machines. This still sounds like a lot of bikes, but the fact is that there are no less than 235 motorcycles being taken out of the MC Collection! 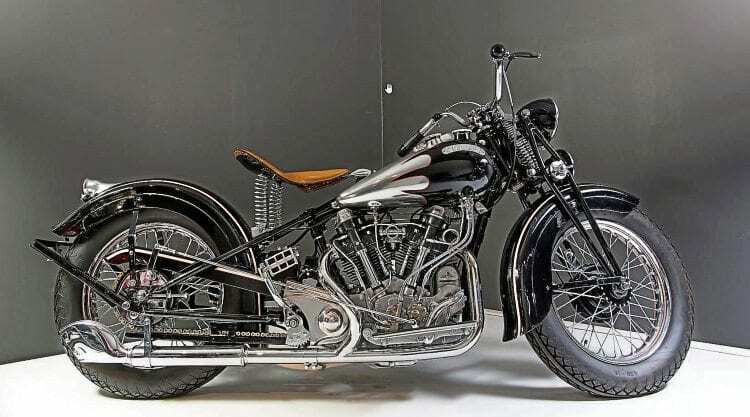 The Crocker Big Tank, built in 1939 and just one of only 72 V-twin Crockers. Previously a resident of Indiana, will it return? The remaining bikes will soon be on display at Tidö Castle, just outside of Västerås in Sweden (about 100km from Stockholm), and the new museum will be opening in the spring of 2019 (look at www.tidoslott.se for more details). The impressive collection has been gathered by Christer over many years. Having first bought a Husqvarna in 1957, he started actually collecting with a silver Norton Dominator – which began a fascination with British bikes – in the Seventies. While clearly an avid motorcycle fan, it was the variety of design that truly fascinated Christer and during the following decade, while having a passion for Swedish-built bikes, he started looking further afield, at bike designs from around the globe, but his focus was still on interesting design.